Note - you can view larger versions of all the program bills in this article by clicking on the images shown. Imagine if you will, Auntie Mame and Ida Cook rolled into one effervescent human being and you would have John Robinson's beloved Aunt Fay, a concert-goer par excellence and, in this respect, she was a carbon copy of her mother Margaret! 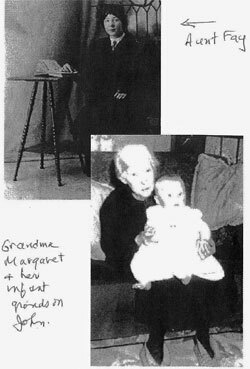 Francis (known to all as Fay) was born in 1900 in Liverpool, where in time she would tag along with her mother, Margaret Robinson, on her theatre excursions. The multitude and wealth of events these two ladies saw during the first part of the last century fairly leaps from hundreds of crumbling programmes. The earliest item, a ticket stub dated simply, "May 11", advises that Margaret witnessed the "gun-totin' cowboys and gallopin' hosses" Buffalo Bill brought to town with his American Wild West Show in the mid-1890s. Quite early, Margaret was exposed to the arts, thanks to the Right Honourable, the Lord Mayor of Liverpool and the Lady Mayoress (Mr. and Mrs. Louis S. Cohen) who invited her to an ‘At Home’ at the Town Hall on 18 December 1899. In a varied programme, she must have relished the classical songs by Madame Nourry and F. Trowbridge. In 1901, amidst a welter of plays, she heard the voice of rising English tenor, John Coates, on 11 March when he sang Valentin in Audran’s Olivette with Leonora Braham as Bathilde, the Countess of Rousillon. 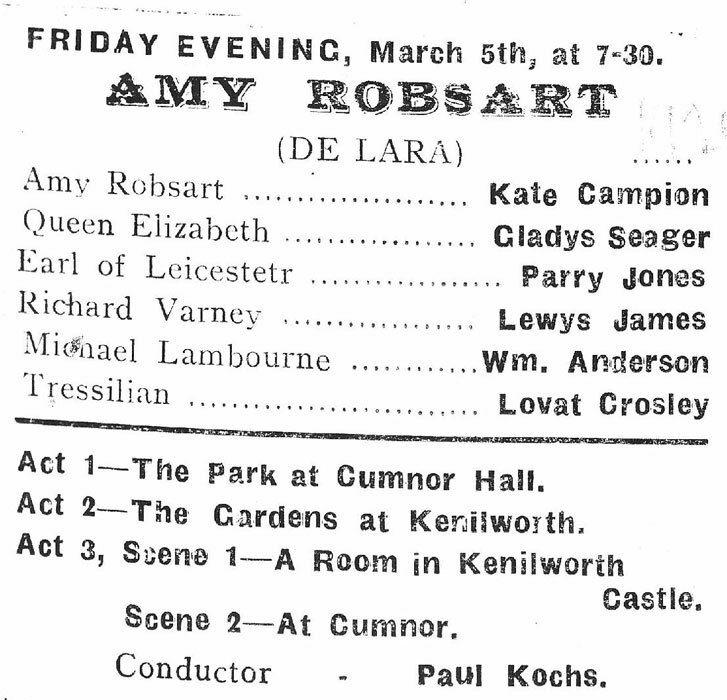 About two weeks later on 28 March, she attended a Grand Concert, a gathering that involved the talents of singers, E. de Lara, Robert Cunningham, Emilie Young, Max Eugene and Ernest Troubridge. This unique experience she surpassed on Good Friday, 5 April, when she attended a sacred concert, noteworthy if only for the number of encores given, ten in all. Renowned Madame Marie Tietjens sang ‘The Holy City’ and ‘There is a green hill far away’ by Gounod, while bass Arthur Winckworth intoned ‘O Divine Redeemer’ and the overly sentimental song, ‘Daddy’. Other vocal contributions were by George Platt, Mabel M. Wells, Robert Cunningham, Cissie Smith and Charles Aspinall. Almost everyone supplied one or more encores. On 22 April, Margaret experienced the striking musical The Geisha by Sydney Jones with Emma Boccardo as O Mimosa San, Arthur Appleby as Reginald Fairfax, Ely Juarez as Juliette Diamant and William Cromwell as Wun-Hi. Towards year’s end on 11 November, she attended a performance of An Emerald Isle (or The Caves of Carrig-Cleena), a comic opera set in 1800 Ireland, with Dillon Shallard as The Earl of Newtown, Sydney Bracy as Terence O’Brien, a young rebel, and Jessie Rose as Lady Rosie Pippin. Another gem seen on 9 December was Leslie Stuart’s popular Florodora with Amy Augarde as Dolores. 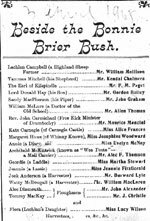 1902 began in a similar vein as Margaret attended a performance of The Fenian by Hubert O’Grady on 3 January with Faulkner Cox as Jack Lynch and Irish comedian Shaun Glenville as Barney the Barracker. Then, in quick succession came London’s Curse (10 February); The Milestones of Life (17 February); The Toreador (3 March) and another performance of Shakespeare’s Henry V (17 March). Then, it appears she experienced her first grand opera when the Moody-Manners Opera Company presented Faust in Liverpool on 7 April with a cast that included Charles Manners as Méphistophélès, John Child as Faust, Ella Russell as Marguerite and William Davies as Valentin, all under the guidance of conductor Harold Vicars. 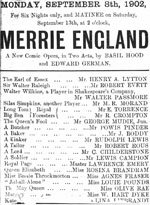 Continuing this musical pattern on 10 May, Margaret saw the comic opera Chilperic with tenor Courtice Pounds in the title role, followed by German’s Merrie England on 8 September with Henry Lytton as Earl of Essex, Robert Evett as Walter Wilkens and Rosina Brandram as Queen Elizabeth. Next, on 29 November, she took in Shakespeare’s The Merchant of Venice with fabled Henry Irving as Shylock and Ellen Terry as Portia. For his efforts, Irving was rewarded in the press the following day with this accolade: “He never sustained the character with more force, pathos or conviction, and never had a more appreciative audience.” Irving was seen as well in Lettie, another musical creation by Arthur W. Pinero, but the programme is undated. 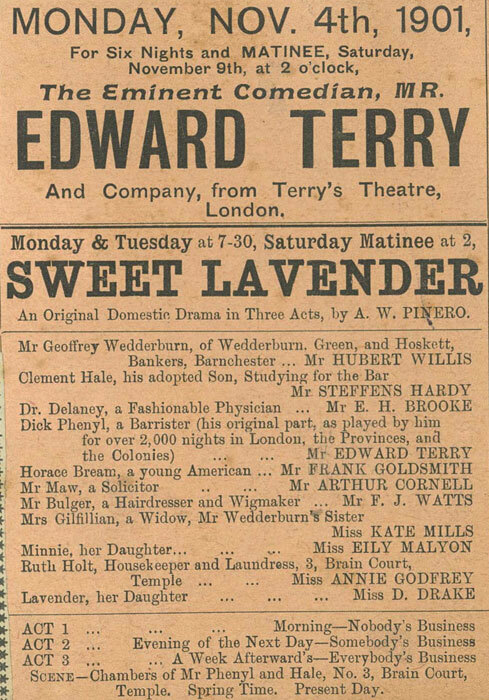 Of sixteen plays seen in 1903, perhaps the most entertaining was the romantic comedy David Garrick seen on 16 February in the Star Theatre in Williamson Square with E. Hoggan-Armadale in the title part. 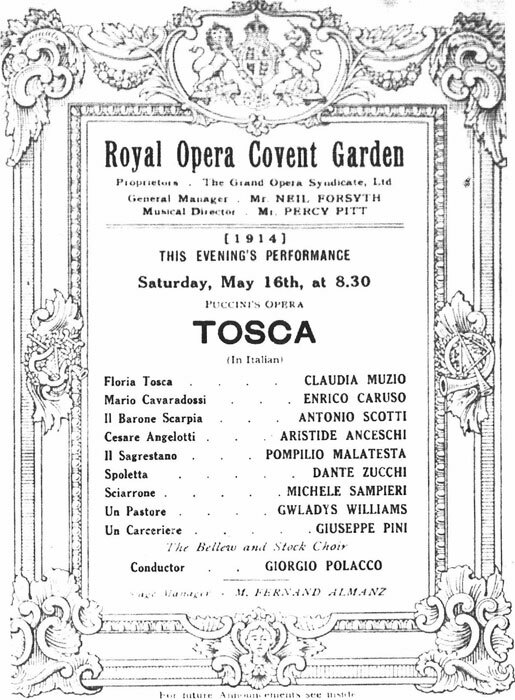 However, a trip to London that spring enabled her to continue her operatic exploits at Covent Garden where the Moody-Manners Company was ensconced, providing on 30 March the double bill of Cavalleria Rusticana and Pagliacci with two eminent tenors in action, Philip Brozel as Canio and Francis MacLennan as Turiddu. Lola was sung by Florence Easton who would become Mrs. MacLennan in May 1904. Santuzza was none other than Blanche Marchesi. 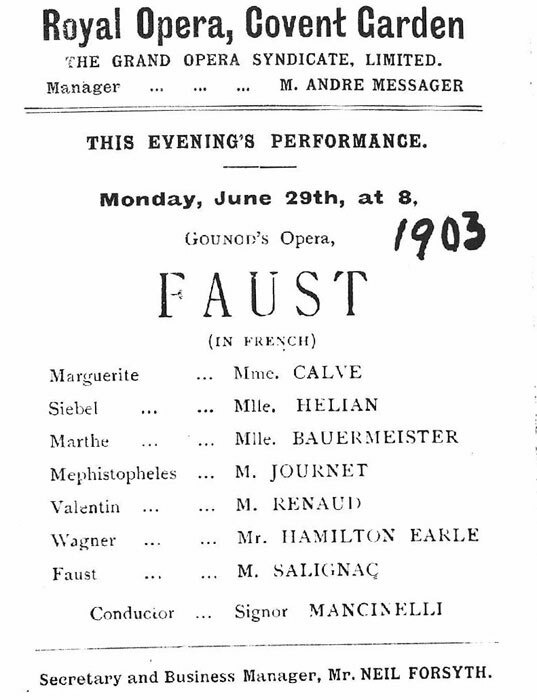 After seeing A Country Girl with Sydney Barraclough on 23 March 1903, she returned to Covent Garden on 29 June to be charmed by Emma Calvé in Faust with Messrs Salignac and Journet. Thoroughly hooked, she would in years to come, queue at the box office for every opera she could manage. However in 1904, a mystery exists. Why did the lady, according to a lack of programmes, settle for just a lone visit to the Royal Hippodrome, there to be entertained by Nelson Hardy, a ventriloquial impersonator; the Bros. Harrison vocalists, patterers and expert dancers; the three Rickards, continental acrobats; the Great Zarmo, America’s droll juggling comedian and other acts. She certainly did not neglect the bustling music-halls, for in addition to the Hippodrome, she frequented the Empire and Palace Theatres to take in such events as encapsulated versions of Mikado and Gondoliers sandwiched between the acts of comedians, fiddlers, acrobats, jugglers and balladeers. But why no opera, concerts or the like that year? Or did she neglect to save the programmes? Back on form in 1905, with more plays and musicals, on 6 March, she saw ‘The London Fireman’ with Forbes Knowles as Colonel Fleming, Edward Garside as Hal Curtis, Ella Vine as Grace Curtis and Violet Temple as Gladys Fleming. A week later she took in The Duchess of Dantzic with Amy Augarde as Catharine Upscher, later as the Duchess. On 27 March, she saw ‘The Tempest’ with William Haviland (Prospero), S. T. Ewart (Alonzo) and Nora Kerin (Miranda). 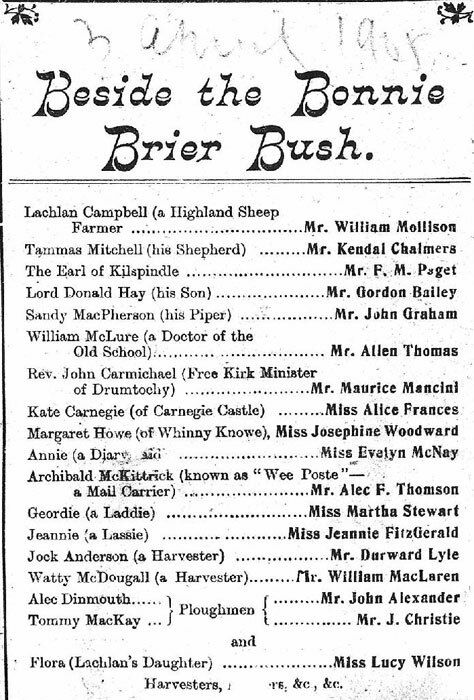 Then, on 3 April, she was on hand when the Scottish musical ‘Beside the Bonnie Brier Bush’ was performed with the principal character Jock Anderson, a harvester, portrayed by Scottish tenor Durward Lely, though on this occasion he was listed as ‘Lyle.’ Attending William Gillespie’s Clarice on 4 September, she saw Lucille La Verne star as Judith Clancy. Next in the classic ‘Oliver Twist’ on 16 October William Mackintosh was Fagin, Webb Darleigh was Bill Sikes, Michael Sherbrooke was The Artful Dodger and Gertrude Lang was Oliver. 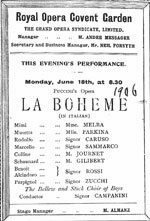 Thanks to a repeat visit to Covent Garden in 1906, she was able on 18 June to watch Caruso and Melba interact in La Bohème. Imagine her excitement! The next evening she was back to soak up the velvet-tones of Kirkby Lunn as Carmen. Again home in Liverpool, she welcomed the Moody-Manners Company on 6 August when their Faust included Wilson Pembroke (Faust), Charles Manners (Méphistophélès), Fanny Moody (Marguerite) and Marshall Vincent (Valentin), all led by Romualdo Sapio. On 21 June 1907, she took in a performance at the Garrick Theatre of The Truth, a comedy that featured the redoubtable Marie Tempest as Becky Warder. At the Savoy, the next night, she saw Iolanthe with C.H. Workman (the Lord Chancellor), Henry Lytton (Strephon), Harold Wilde (Earl Tolloller) and Miss Louie Réné (Queen of the Fairies), conducted by Francois Cellier. Two nights later a theatre visit yielded a viewing of The Walls of Jericho by Alfred Sutro. That autumn Moody-Manners came calling again, allowing Margaret to see an Aida on 30 September with Joseph O’Mara as Radames, Clementine de Vere Sapio as Aida, Lewys James as Amonasro, Toni Seiter as Amneris and Charles Manners as Ramphis. The soprano’s husband again conducted. On 10 October she had a chance to see heart-throb Martin Harvey again as Count Skaratine in A Cigarette Maker’s Romance with N. de Silva as Viera. On 2 December, she re-visited Faust with Charles Magrath as the Devil, O’Mara as Faust and Fanny Moody as Marguerite. During the next two years, Margaret must have been otherwise engaged as just one programme exists. It reveals she saw Lohengrin by Moody-Manners on 28 September 1908 with Brozel, de Vere Sapio (Elsa), William Dever (Telramund), Charles Magrath (King) and Mary Louise Roger (Ortrud), led by Richard Eckhold. Her sabbatical seems to have ended on January 8, 1910 with Mendelssohn’s Elijah, again a product of Moody-Manners as dramatized by Harrison Frewin. The soloists were Graham Marr, Florence Morden, Wilson Pembroke and Harry Brindle. On Monday, 4 April, she saw Tannhäuser with O’Mara in the title role, de Vere Sapio as Elizabeth and Lewys James as Wolfram. Three nights later she attended an Il Trovatore with Brozel as Manrico, de Vere Sapio as Leonora, Mary Louise Roger as Azucena and Charles Moorhouse as Di Luna with Hawley conducting. That summer, she journeyed to a mystery location (not shown on the programme) to see four operas, beginning with Il Trovatore on 16 May with Signora Protti (Leonora), Signor Barbato (Manrico) and Mme. Corretta Castellano (Azucena). Two nights later, Il Barbiere di Siviglia featured Signorina Bianchi (Rosina), Signor Bartera (Almaviva), Signor Vail (Figaro), Signor Quintina (Dr. Bartolo) and Signor Vitton (Don Basilio). Next, on 23 May, she was present for a Lucia di Lammermoor with Signorina Bianchi, Signor Sioli and Signor Vittori. Finally, on 26 May, Signora Protti, Signor Sioli, Signor Vittori and Signor Vail as Valentine provided a performance of Faust. In November, Margaret seated herself in the Royal Court Theatre to watch as Beecham's Opera-Comique Company presented The Tales of Hoffmann. Especially fine were the delicious voice and antics of Caroline Hatchard as Olympia, the brilliance of John Bardsley as Hoffmann, ill-fated W. J. Samuell as Dappertutto and a delightful Edith Evans as Giulietta and Antonia. Hawley conducted. 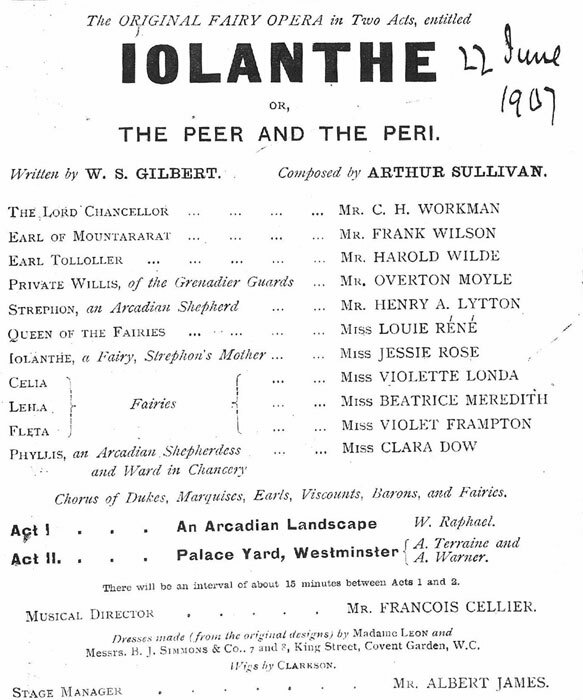 Late the following year the Quinlan Opera came to visit on 10 October, enabling Margaret to see Tannhäuser again, this time with John Harrison in the title role, Bettina Freeman (Elizabeth), Vera Courtney (Venus), Allen Hinckley (Landgrave) and Robert Parker (Wolfram) with Cuthbert Hawley conducting. Meanwhile American Oscar Hammerstein had been giving a season of opera at his newly-built edifice, the London Opera House. During his second season in 1912, Margaret was on hand on 6 May for La Favorita with Augusta Doria as Leonora di Guzman, Orville Harrold as Fernando and Henry Weldon as Baldassare, conducted by Fritz Ernaldy. Harrold’s soon-to-be wife Lydia Locke portrayed Inez. Margaret returned on 27 May to see The Tales of Hoffmann, now sung in French by Frank Pollack (Hoffmann), Bertha César (Olympia), Victoria Fer (Antonia) with Vilmos Beck (Dappertutto, Coppelius and Dr. Miracle). Gaetano Merola conducted. The season included Rigoletto, Don Quichotte, The Barber of Seville, Faust and The Children of Don, although apparently Margaret saw none of these productions. During a re-visit to her mystery venue on 18 September, Margaret saw Carmen with Signora Gorreta, Signor Ferri (Don José), Signora Defral (Micaëla) and Signor Terrasi (Escamillo). Again at this location on 30 October, she witnessed a Lucia di Lammermoor sung by Signora Gavlosca, Signor Ferri and Signor Terrasi. Musical legends often swept into town. On 23 September, 1912, Margaret witnessed the ‘dancing revelation of the age Anna Pavlova’ backed by Novikoff and members of the Imperial Russian Ballet. Fritz Kreisler cradled his violin, Peter Dawson sang in concert with another fine violinist Renée Chemet while Maggie Teyte, Louise Kirkby Lunn, Leila Megane and Clarence Whitehill gave solo concerts. The venerable British opera, Balfe’s The Bohemian Girl, was quite often performed at this time. 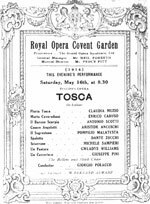 Margaret saw the opera on 26 December 1912 with Graham Marr, Raymonde Amy and William Anderson conducted by Richard Eckhold. On 13 February 1918, she was able to introduce Fay to this music. More visits to London in 1913, possibly with Fay, provided Emmy Destinn as Senta in Der Fliegende Hollander at the Garden, while down the road at Drury Lane Theatre, courtesy of Sir Joseph Beecham, they were likely bowled over by Chaliapin's Boris Godounov. The following year on 16 May, they saw Caruso, now world famous, romancing Claudia Muzio in Tosca with Scotti as the evil Scarpia. Two days later, Margaret found herself in Paris taking in an unusual work, the lyric drama Scemo by Charles Méré and Alfred Bachelet with Yvonne Gall as Francesca and M. Altchevsky as Scemo. Benedict’s Lily of Killarney, another now largely forgotten Victorian comic opera, seems to have appealed to the Robinsons as they saw it in 1915, 1917 (twice) and in 1918 when Lewys James appeared as Danny Mann. A Savoyard in his youth, tenor Walter Hyde had advanced to grand opera when Fay saw him first as Fra Diavolo in 1915 and then as Romeo in 1916 during visits by Moody Manners. The following year, Hyde came with the H.B. Phillips Company to sing Canio but took ill so Frank Mullings sang instead. When McMurragh’s opera Shaun the Post was staged for the first time in Britain on 25 February 1915, Margaret was present to watch Ben Williams portray Shaun, Appleton Moore as Colonel O’Grady and Frederick Glendon as Michael Feeney. André Skalski conducted. Later that year, the Carl Rosa Opera visited Liverpool where Margaret, and perhaps Fay, saw Ambroise Thomas’s Mignon on 3 December with Beatrice Miranda and Hughes Macklin leading the forces on stage. Since Fay began tagging along, she seems to have developed a crush on a certain luscious-voiced baritone for she saw Lewys James a total of twenty-three times! 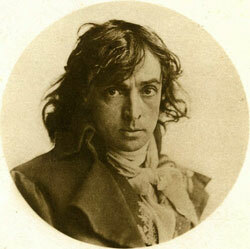 In addition to standard roles, he appeared in De Lara's Amy Robsart and The Attack on the Mill by Alfred Bruneau, tuneful but forgotten relics today, and in a double bill: The Storm-Wrack by James Lyon and The Witch Dancers (Puccini's Le Villi) when it was first given in Liverpool by the H.B. Phillips Company on 9 April 1918. Once again, as the Robinsons looked on, a visiting Moody-Manners company presented Tschaikovsky’s Eugene Onegin on 14 January 1916 with a cast comprising Hubert Dunkerley (Onegin), Fanny Moody (Tatiana), Furness Williams (Lenski), Harry Brindle (Gremin) and Enid Cruikshank (Olga). Aylmer Buesst presided. When Sir Thomas Beecham brought his opera company to Liverpool to serve up a matinee Rigoletto on 26 December 1917, Fay could enjoy Lewys James as the hunchback with Nora D’Argel as Gilda and Gwynne Davies as Duke of Mantua. Their only Mozart opera, as evidenced by a programme, was The Marriage of Figaro on 21 February 1918 and perhaps they came as Lewys James portrayed Figaro with Florence Morden (Countess), Albert Kirkman (Count), Enid Cruikshank (Susanna) and Herbert Talbot (Bartolo). Next, Margaret and Fay were no doubt delighted to attend the Grand Gala on 17 June 1918 that celebrated the centenary of Gounod, who was born on that date in 1818. 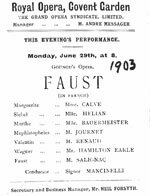 The opera was his most famous: Faust, with Ethel Austen as Marguerite, E. C. Hedmondt (Faust), Kingsley Lark (Méphistophélès), Charles Manners (Valentin) and Olive Westwood (Siebel). The ladies caught up to James again on 19 January 1919 when he appeared as Peter in Humperdinck’s Hansel and Gretel with Esther Yunson (Gertrude), Enid Cruikshank (Hansel), Evelyn Bailey (Gretel) and Nelly Watt (the Witch). On 15 April, they saw Carl Rosa’s first performance in England of Stella Maris, an opera by Alfred de Keyser with Beatrice Miranda (Marga), William Boland (Yanik) and Kingsley Lark (Silvain), conducted by Henriquez de la Fuente. They chalked up more Puccini on 18 October when Manon Lescaut had its initial airing in Liverpool. Dorothy Phillips was Manon, Charles Neville Des Grieux, Wilfred Davies Lescaut and John C. Browner Geronte. 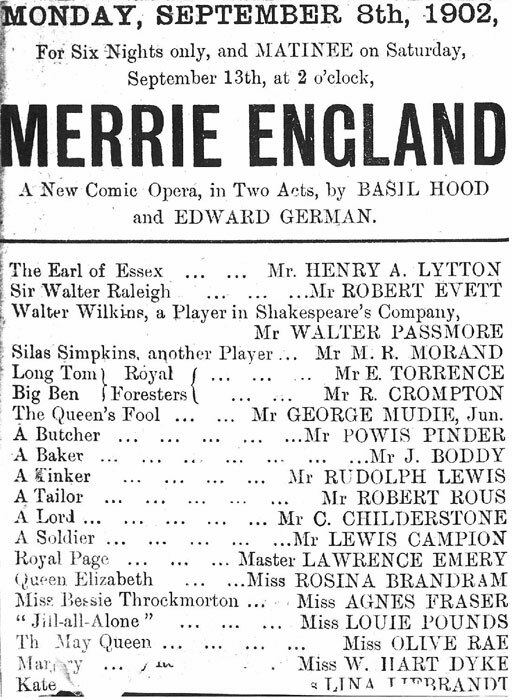 Their list was expanded when Rosa returned on 27 November to present Nicolai’s Merry Wives of Windsor with Beatrice Miranda, Arthur Winckworth and Florence Barron. The next evening they witnessed the progress of a rising star, Eva Turner, whom they had seen as Venus in Tannhäuser two years earlier; now she sang Thérèse in Somerville’s medieval age opera The Miracle (or The Story of Antoine) with Hughes Macklin as Paul, Kingsley Lark as Antoine and Arthur Winckworth as the Curé. During a visit to Malta in 1922-3, they discovered that the Theatre Royal was presenting local forces in Rigoletto with A. Chiappini (the Duke), L. Piazza (Rigoletto), A. Boccanera (Gilda) and B. Carmassi (Sparafucile) conducted by Luigi Cantoni, so they purchased tickets. Back home the newly-created British National Opera was beginning to flourish, so when they visited Liverpool on 20 February 1922 to perform Aida, the ladies made sure they saw Beatrice Miranda as Aida, Frank Mullings as Radames, Evelyn Arden as Amneris, Powell Edwards as Amonasro and Norman Allin as Ramphis. Percy Pitt conducted. To celebrate Easter in 1923, they journeyed to London on 30 March, for a Good Friday performance of Handel’s Messiah by the Royal Choral Society at Royal Albert Hall featuring soloists Ruth Vincent, Walter Hyde, Edna Thornton and Norman Allin with Eugène Goossens as conductor. Frequently at the opera in 1925, our ladies were in attendance when the British National Opera came to Liverpool to present Debussy’s Pelléas and Mélisande 17 February. Perhaps they were drawn by the presence of likable Walter Hyde as Pelléas with Sylvia Nelis (Mélisande), Robert Parker (Golaud) and Norman Allin (King Arkel). The next night they returned to see Hugh the Drover by Vaughan Williams with Tudor Davies as Hugh, May Blyth as Mary and William Anderson as the Constable. On 20 February, they took in Rimsky Korskoff’s The Golden Cockerel and on 5 March Rutland Boughton’s Alkestis with Hyde as Admetus, Muriel Brunskill (Alkestis) and Robert Parker (the God Apollo). Finally on 1 April, they watched Frank Mullings as Otello manhandle Miriam Licette as a scheming Iago (Herbert Langley) gloated. Julius Harrison conducted. 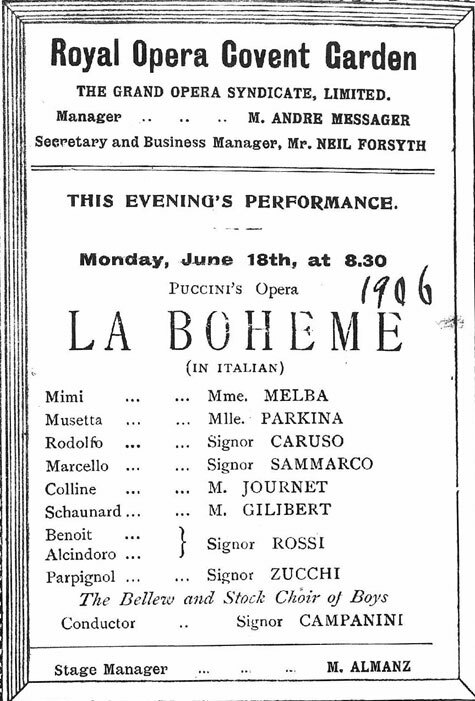 Then, when the London Syndicate of Opera gave a season at Covent Garden in June and July of that year, the Robinsons attended five performances. On June 10, they saw Bruno Walter conduct Richard Strauss’s Der Rosenkavalier with Gertrude Kappel as the Marschallin, Richard Mayr as Baron Ochs and Delia Reinhardt as Octavian. The next evening it was Der Fliegende Hollander with Frida Leider (Senta), Friedrich Schorr (Dutchman), Fritz Soot (Erik) and Otto Helgers (Daland), Robert Hager conducting. On July 1, they took their seats to enjoy a performance of Il Barbiere di Siviglia with Toti Dal Monte (Rosina), Ernesto Badini (Figaro), Dino Borgioli (Conte d’Almaviva), Mugnone conducting. On 2 July, it was Andrea Chénier with Giacomo Lauri Volpi in the title role, Margherita Sheridan as Maddelena and Benvenuto Franci as Gérard with Dennis Noble doing double duty as both Fléville and Dumas. Finally, on the next evening, they relished Elisabeth Rethberg’s Cio-Cio-San with Franco lo Giudice (Pinkerton), Ernesto Badini (Sharpless) with Sergio Failoni conducting. In September 1926, the ladies, perhaps Fay alone, spent three idyllic weeks in Lucerne, Switzerland, literally awash in music. Herr J. Breitenbach at the organ led off in sprightly fashion. Then, the extravaganza unfolded with music by the Italian Kursal Orchestra conducted by Cav. Angelo Fumagalli of Scala, Milan. All day long, familiar melodies and those less so, wafted on the autumn breezes, joyfully embracing the hearts of all those who listened. In 1927 the musical My Son John by Oscar Strauss brought delight at the Shaftesbury Theatre on 19 March with Billy Merson as Benjamin Littlewood. So did an organ recital by H. Moreton at Plymouth Guild Hall on 8 September. John Robinson: “I cannot quite remember when my Grandmother died. I was about 11 so it must have been about 1965. She was a lovely, old Irish lady, well into her 90s. I remember she was always dressed in black …”He described his Aunt Fay as "a very clever person who wanted to make music her life. She studied the piano and emerged wearing the cap and gown of success. She would entertain us for hours." Fay had a beau who survived the trench horrors only to perish soon after on an English roadway. She never married; instead, she became a personal hair carer while continuing her love of the stage. 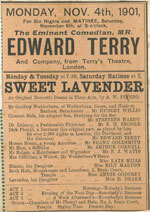 In the thirties, the musical play Lilac Time became Fay’s all-time favourite. Blessed with music by Schubert, it was revived in London at the Globe Theatre on 26 December 1932 with Maurice d'Oisly as Schubert, Rose Hignell as Lili and Percy Heming as Shober. Nor did she miss revivals in 1933, 1934 and 1935. John also recalled how "Much later when I was about four or five, she would take me to the ballet or to G&S on a Saturday afternoon, followed by tea in the Kardoma Cafe in Liverpool, a real treat. We also saw all the musicals, but it was not until I was a bit older that I started to accompany Aunt Fay to the opera, Sadler's Wells in the 60s, I think. When I began to work at 15, it was a great pleasure to treat my Aunt to a theatre visit, but she'd always have tickets for the following week. My Aunt Fay died in 1976. 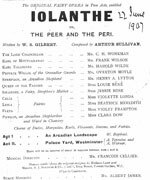 I still miss her..."
The programmes reveal a few Gilbert & Sullivan operas attended in the 1920s. Let the names of Henry Lytton, C.H. Workman, Robert Evett, Leo Sheffield and Bertha Lewis, in both G & S and in Merrie England, evoke those glory days and perhaps you will think of someone like John's folks … yes, like Fay, John became a hair stylist with his own Liverpool shop. No surprise: he retains a keen interest in opera to this day. 1. Not detailed or mentioned are several La Bohème, Tosca, Madama Butterfly, Faust, Rigoletto, Il Trovatore, Cavalleria Rusticana/Pagliacci and other additional performances. 2. An earlier version of this article with emphasis on Gilbert & Sullivan works was rejected by the Sullivan Journal. The author altered it to one of a general nature and expanded it considerably for presentation here.